Home > Fresh Steamer Clams! Our Tender & Sweet Soft-shell Clams are dug daily by the local Clam Diggers! We hand pick only the finest Soft Shell clams for shipment to You! 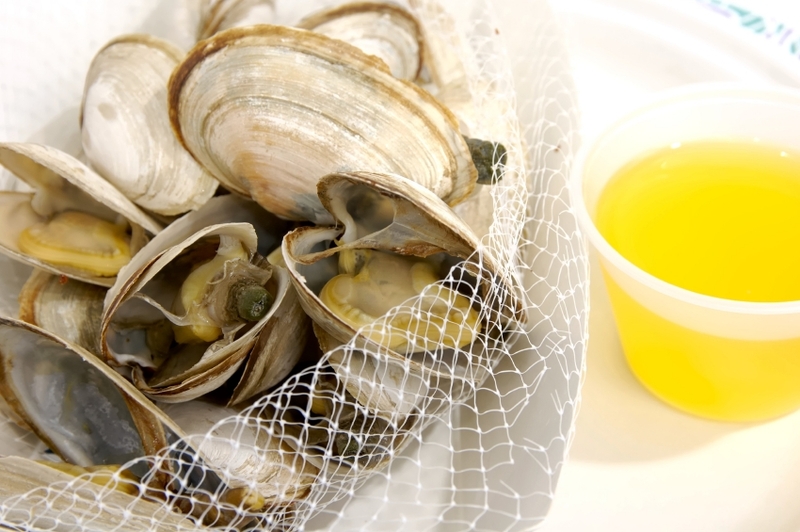 There is nothin' like Fresh Steamers Dipped in Butter! All orders come with a personalized card with Your Message & Cooking Instructions for easy preparation! Please keep in mind that steamers are soft shell clams and a small amount of shell breakage can occur in transit. Fresh Mussels! • Fresh Little Neck Clams • Fresh Oysters! Order Soft Shell Steamer Clams And Have Them Shipped Fresh Overnight Right To Your Door! Order By 10 am Today For Next Day Delivery, all you need to do is get your butter ready! Steamers are shipped live in the shell. One order is one quart. A quart is one and a quarter to one and a half pounds. There are typically 13-18 steamers per quart. 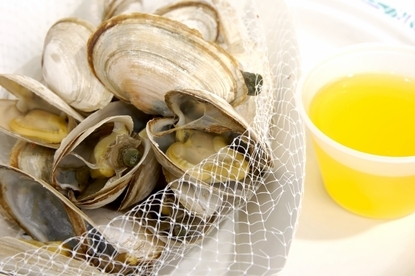 Order Our Fresh Steamer Clams By 10am EST, And Enjoy Them For Dinner Tomorrow! Our Steamers Also Make A Great Gift Idea For Your Favorite Seafood Lover! How Easy Is That! The steamers that I sent to my brother in California are sweeter and more delicious than the locally bought steamers in and around NH/Mass. Again...Thank You Capt. Tim. My Brother loved them all the way from California !! The clams are very meaty, and they taste great. First-rate quality. First and foremost, the clams were fresh and succulently yummy. Second, I want to rave on this business's customer service. The clams we ate were the second shipment. The first arrived with some pretty significant breakage (about a quart out of the three we ordered) - we sent pictures. I, a steamer noobie (read, idiot), thought the other two quarts were frozen and the clams were dead (they were all partially opened and didn't close when tapped, etc.). After I pointed this out to these guys, I got a VERY detailed email that explained, in detail, that I had thrown away 2 quarts of perfectly good steamers. Here's the kicker - they made good on the broken ones, and even though I conceded I was a fool about the "dead" clams, they split the difference and shipped us 2 quarts of steamers (which we just ate) at no additional cost. You just do NOT find that kind of customer service often anymore. We'll be back. We can't find clams like these anywhere out west! So fresh and delicious! I think that next time we'll order a whole lot more of these! These clams were the best I've ever had. Thanks for another perfect order Cap't Timmy! Loved these clams! delivered right to my dorm for my birthday!Fresh sweet and all gone! I need more like now! I miss the clams of home, they are sooo good! thanks Daddy! clams arrived on time and fresh with no broken ones. I had tried them from another company, and more than 1/2 was broken from them. oyu have my business now. I really MISSED MY STEAMERS! I got these as a gift for my Birthday,(best thing ever)and no broken ones at all. I need more! Casey L.
Order steamers and lobsters and they were great! The steamers came packed with a lot of care, and only had one cracked one! That says a lot for this companies commitment to its product and to its customers! Will order more for sure. I grew up on the east coast and used to dig my own clams. I actually found someone who shipped me clams that I grew up digging! A couple of broken ones in shipment, but well worth it! Best tasting freshest Steamer clams I had in years! Russell D. Daytona Beach Fla.